Joel Cooper - back in squad after his one match suspension. With just three league games to go until the split, Glenavon are well placed to put the pressure on Cliftonville. This Saturday could be another significant day in the race for Europe with Glenavon at home to Ballinamallard while the Reds face Linfield. A win for Gary Hamilton’s side and anything other than a win for Cliftonville would see Glenavon, a point behind, go third. “Cliftonville are the team in our sights,” says boss Hamilton. 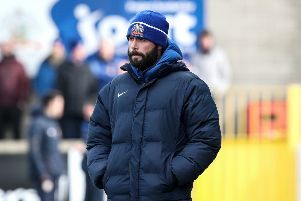 “However, we also have to look over our shoulder because Coleraine are close behind. It is important for us to focus on what we do. If we keep winning then it does not matter what happens below us. We have to play Coleraine twice and both Cliftonville and Linfield in the split so there is still a lot than can happen. Joel Cooper comes back into the side after his one match suspension, with recent addition Ian Morris expected to be on the bench. Kevin Braniff missed the trip to Warrenpoint due to the flu, his fitness and that of Daniel Kearns will be assessed on the day of the game. These are games Glenavon must win if they are to secure a place in Europe through the league door. United’s away form has not been good and on their last visit to Mourneview Glenavon chalked up a 5-1 win.